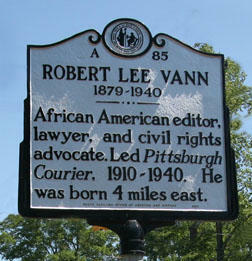 North Carolina native Robert Lee Vann was a pioneer of journalism during his lifetime. He served as editor of "The Pittsburgh Courier" which was the largest black newspaper in circulation until Vann’s death in 1940. He was recently commemorated in his hometown of Ahoskie, NC with a long-earned historical marker. Marvin Jones of the Chowan Discovery Group and Cash Michaels, editor of The Carolinian, join host Frank Stasio to talk about both Vann's legacy and the legacy of the black press.